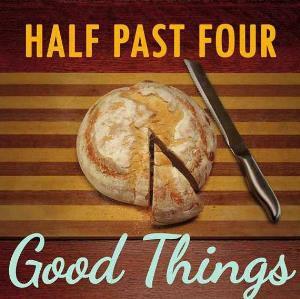 Back in the summer of 2009, the release of Toronto-based outfit Half Past Four’s recording debut – the quirkily-titled Rabbit in the Vestibule – caused quite of bit of stir in the progressive rock community. However, in spite of the album’s largely positive reception and a barnstorming appearance at the 2010 edition of ProgDay, the band seemingly dropped off the radar for over two years. Formed in 2005 by vocalist/lyricist Kyree Vibrant and three musicians of Eastern European descent – bassist Dmitry “Les” Lesov, keyboardist Igor “Iggy” Kurtzman and guitarist Constantin Necrasov – the band were very active on the live front both in Canada and in the US until the search for a new drummer (a problem jokingly referred to as “Spinal Tap-like” on the band’s website) forced them to take a break. In early 2012, drummer Marcello Ciurleo finally joined, allowing the band to concentrate on the recording of Good Things. Those who missed Half Past Four the first time around might be forgiven for thinking they are just another newcomer to that “female-fronted prog” bandwagon that has yielded a multitude of technically impeccable, though often soulless Annie Haslam clones. However, even a quick spin of Good Things will put any such fears to rest, because the Canadian quintet’s sophomore effort is a concentrate of humour, original ideas and outstanding musicianship that will reconcile a lot of jaded listeners (myself included) with a genre that, in recent years, seems to have left quality control by the wayside. The album’s unassuming title and delightful, retro-style artwork also stand out on a scene where hyperbole and pretentiousness abound, emphasizing the light-hearted attitude that has always been one of Half Past Four’s defining features. Half Past Four can be counted among the trailblazers of what I call the “new frontier” of progressive rock – a 21st-century take on the “art rock” form associated with such diverse acts as Roxy Music, David Bowie, 10cc, Steely Dan and Supertramp. While many new bands follow in the footsteps of the classic icons of the genre, often letting their ambition run wild to the detriment of quality, bands such as Half Past Four, MoeTar and 3RDegree (as well as a number of others) imbue that old pop music staple – the “short” song form – with progressive sensibilities, skillfully demonstrating that complexity does not necessarily mean excess. Indeed, Good Things is packed with the kind of twists and turns that every self-respecting progressive rock album should offer, From a compositional point of view, the band has grown exponentially, and using the term “quantum leap” would not be an overstatement. In particular, Kyree Vibrant’s stunning vocal performance throughout the album elicits comparisons with MoeTar’s Moorea Dickason and District 97’s Leslie Hunt – both experienced, well-rounded artists like Kyree herself, as well as gifted vocalists. Her strong, confident voice dominates the proceedings, from the soothing, wistful tones of “Fate” to the breathtaking acrobatics of the Russian-inspired “Spin the Girl” and the anthemic “Rise”. Each of the musicians strives to create s an extremely tight instrumental texture. Keyboardist Iggy Kurtzman’s consistently outstanding work anchors the album and complements the singing in dramatic flurries or in gentle brush strokes. Newcomer Marcello Ciurleo and the ever-reliable Dmitry “Les” Lesov lay down complex rhythm patterns, leading the path to exhilarating, dramatic crescendos of intensity and assisting Constantin Necrasov’s head-on riffing in the heavier offerings, while capable of more subdued touches in the slower ones. Like most classic albums, Good Things begins and ends on a high note. The jaunty talk-box intro of opener “It Strikes” immediately sets the mood, showcasing the album’s signature juxtaposition of breezy, catchy melodies and heavier, riff-laden sections, bound together by Iggy’s fluid piano and Les and Ciurleo’s pyrotechnic rhythm section, with Kyree’s commanding voice firmly in the lead. On the other hand, closing track “The Earth” reprises the exhilarating intensity of “Biel” on the band’s debut, climaxing with Kyree’s voice soaring to an impossibly high pitch. In such as dense album, there is something for everyone – from the jazzy, jagged “Landmines” (which made me think of both MoeTar and 3RDegree) to the rousing Russian folk echoes of “Spin the Girl”, from the cheery, almost comedic “Wolf” to the subdued atmosphere of “All Day and All Night” and the haunting mix of low-key melody and tense, brooding riffs of “I Am Lion” and the title-track – the latter reminiscent of District 97’s approach, though somewhat more restrained. With a sensible running time of about 58 minutes, and none of the 12 songs over 6 minutes, Good Things achieves an admirable balance, coming across as a mature, highly entertaining album that is already poised to become one of the year’s undisputed highlights. Obviously, those who expect progressive rock albums to contain at least one 10-minute-plus and/or endless instrumental noodlings will not fail to be disappointed. However, if the genre has any hope of becoming relevant again, instead of slowly turning into a parody of itself, it is through albums like this one and bands like Half Past Four.